Hello and welcome back! I'm here today with my fancy friends (all current or former members of the Stampin' Up! Artisan Design Team) for our monthly blog hop. You'll love all of the wonderful ideas you see on this hop, so be sure to circle all the way around. We also have a Pinterest board that you can follow. You might have just arrived from the fabulous Cathy Caines. Hello and welcome back! Today I have a couple more watercolor cards to share. I'm squeezing in a few last blog posts, many with stamps or other items that are retiring. Next week I'll switch over to showing some of the new items that will be available starting June 1st with the new Stampin' Up! 2016-2017 Catalog! This card uses the Balloon Celebration Stamp Set and matching Balloon Bouquet Punch. I used the "no-line watercolor" technique, where I stamped the balloon outline in the ink color first and then water-colored it in with the same color. The colors I used for the balloons are Cucumber Crush, Melon Mambo, Daffodil Delight, Watermelon Wonder, Pumpkin Pie, Bermuda Bay and Tangerine Tango. For the sky, I stamped the clouds in Versamark onto Watercolor Paper, heat embossed in clear and then water-colored over them with a light wash of Pool Party ink. Today I'm popping in to share two cards I made with the Botanical Blooms stamp set and the Botanical Builder Framelits Dies. I love this set of products! I have seen so many beautiful cards made with them, and they never seem to disappoint. For my first card today, I die-cut the leaves out of both Mint Macaron and Bermuda Bay cardstocks, and stamped them with the same ink colors. I die-cut the flowers out of Blushing Bride, Daffodil Delight and Watermelon Wonder cardstocks. I sponged Watermelon Wonder ink on the Blushing Bride flowers, and Crushed Curry ink on the Daffodil Delight flowers. I added some Basic Black Cardstock flower centers and used black sequins also. I added some of the Crushed Curry Enamel Dots to the design as well. Hello and welcome back! Recently I created some projects using a bundle of products including the Party Pop-Up Thinlits Dies and the Party with Cake Stamp Set. Today I have two more cards and a gift box to share with you. For this project, I wanted to make a card that would work for a masculine birthday, so I left off the bright pink and stuck with more neutral colors. I water-colored over my greeting again, but this time it was heat embossed in black. I added a little fringe, this time using the 2015-2017 In Color Envelope Paper. In addition to making personalized envelopes, it’s thinner than our normal patterned paper so it works well with the Fringe Scissors too. Hello and welcome back! Recently I created some projects using a bundle of products including the Party Pop-Up Thinlits Dies and the Party with Cake Stamp Set. I made six birthday projects to share with you. Birthday cards and gift packaging are always handy to have on hand, right? Hello and welcome back! It's time for another Artisan Design Team blog hop, this time sharing our floral projects from the Stampin' Up Facebook page. You're in for a treat because we have so much talent and so many different styles represented by these 20 women from around the globe. Please keep hopping through all 20 so you don't miss a thing! Be sure to use something like Google Translate for those blogs not in your native language. Also, you can find all of our projects for the year in one easy place, on our Pinterest board. You might have just arrived from Krista Frattin, and I know you loved her fresh designs as much as I did. We had several different flower stamp sets to choose from this month, and my projects today feature the Botanical Blooms Photopolymer Stamp Set and the Botanical Builder Framelits Dies. Hello and welcome back! I'm back today with the monthly One Stamp at a Time Blog Hop. Our theme this month is May Flowers. Hopefully you're not sick of flower projects yet! But it is spring, so you're probably going to see a few more around here. I have had the Grateful Bunch Photopolymer Stamp Set and the Blossom Bunch Punch since last November, and I still hadn't used either of them on a project. So, I pulled them out and decided to show them some crafty love. I've got 3 different cards, and a small gift box to share with you. Hello and welcome back! Today I'm sharing the other two cards using the Shine On Specialty Designer Series Paper as the focal point. I sponged the patterned papers with the matching inks again. I cut the wavy Bermuda Bay pattern along the wave pattern, which was perfect for water for this boat. The bottom of the boat was a circle punch cut in half (or a little less than half). The sails was a square punch cut in half, and one half trimmed down even more. The background was made from Soft Sky Cardstock and the circles dies, and again I layered it over a Vellum Cardstock circle. Hello and welcome back! 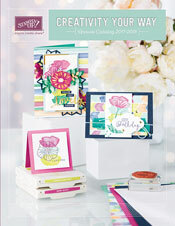 I have two cards to share today featuring the Shine On Specialty Designer Series Paper. I decided to make a set of cards using this fun paper to make some small scenes. One other thing I did to the paper was to sponge it with the corresponding ink color, to cover a bit of the kraft background and give it more of a tone on tone look. The colors of ink used that match the paper are Watermelon Wonder, Cucumber Crush and Bermuda Bay. Hello and welcome back! I'm popping in today to share a card I made for the Global Design Team challenge #34, which is a sketch challenge by Teneale Williams. Have you seen her blog? She makes beautiful cards, both inside and out.